Kill cravings and support weight loss with IdealBar Snack Bars! A Delicious, Hunger Blocking Weight Loss Snack You Can Enjoy!! When you’re in need of a quick and delicious snack that’s calorie controlled and that can help block hunger for up to 3 hours, you need IdealBar! 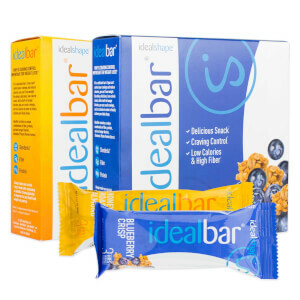 In order to fit your weight loss needs we specifically formulated the IdealBar to be extremely delicious, help with hunger control, as well as provide beneficial nutrients. 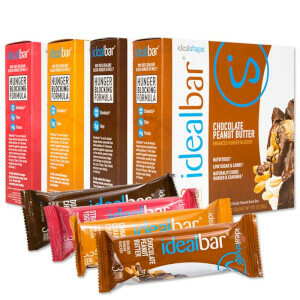 IdealBar is a great way to take your weight loss plan with you, on the go! With the power of the hunger-blocker Slendesta, IdealBar helps curb hunger cravings in a simple weight-management snack bar with 150 calories, or less.With 10 grams of protein and packed with several vitamins and minerals, IdealBar has the nutrients your body needs for energy to last until your next scheduled healthy meal! 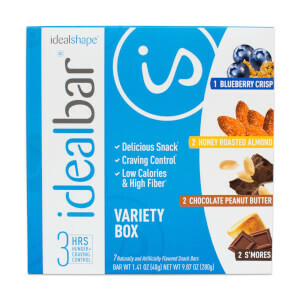 Plus, IdealBar is made with VitaFiber™, making IdealBar even more filling and easy to digest! Available in Chocolate Peanut Butter, Cinnamon Caramel Crunch, and Double Chocolate, you'll never have to "cheat" on your diet... but it might feel like you are! Slendesta is a potato protein extract specifically designed to curb your hunger.